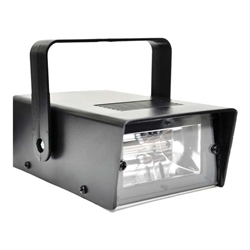 DJ mini strobe light features adjustable mounting bracket, 20-watt output power and variable speed control. Includes long life Xenon bulb that delivers over 100 million flashes and attached 6 foot AC power cord. Bulb is non-replaceable.